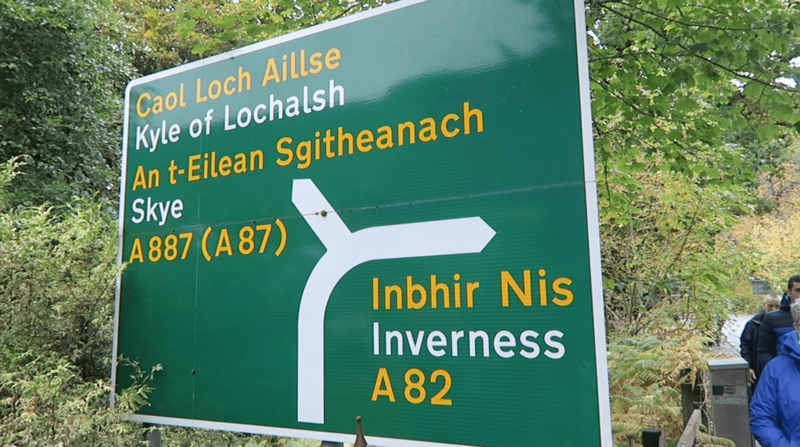 In this post I want to share some photos I took of bilingual Scottish Gaelic – English signage from a recent trip I made to the Highlands of Scotland. It was my first visit to areas where Gaelic still hangs on, in pockets, as a minority language. I vlogged the trip in a series of five videos (from Loch Ness, the Isle of Skye, Inverness, Culloden, the Cairngorms National Park and Speyside). The two of them that are most focussed on the language are linked at the bottom of this post. Scottish Gaelic is one of Scotland’s indigenous languages. It’s Celtic and closely related to Irish and Manx. It’s a cousin of Welsh, Breton and Cornish. As a learner of Welsh and Basque, I need no encouragement to give attention to lesser-used languages but as it’s the UN’s International Year of Indigenous Languages, I want to make a special effort to put the spot-light them here at How to get fluent this year and at aspects of learning and using lesser-used languages. Making a language visible on signage won’t, on its own, do much to change levels of use of spoken Gaelic, of course. It can help to raise consciousness, though. It can help as part of a wider revival drive. It’s been an important part of the campaign to improve the status and, to some extent, the fortunes of Welsh. Here are the shots, plus my “reading” of them as an outsider who doesn’t know the language and who’s looking at it from the perspective of his experience in, and knowledge of, Wales and the Basque country. I’ll warn you now: I’m in a stroppy mood (the way the indigenous languages of the British Isles are treated tends to do that to me). To start on a light note, this is a sign in Druim na Drochaid (that’s “Drumnadrochit” for those of you who need an, erm, easy to read and pronounce Anglicised version). It looks pretty official but is it a joke? It’s a message I’ve only otherwise seen in British sea ports where you can drive off the ferry from continental countries where they drive on the right. This was inland and nowhere near any roll-on, roll-off ferry port. Anyway, the message is clear and all to familiar from the way Welsh is treated. In Wales, for example in some automatic check-outs, such as those at W H Smith newsagent/stationer stores, where five or six languages are offered, but no Welsh. It’s the same story at the ticket machines of First Great Western Trains at Paddington Station, when you’re buying a ticket for the mainline from the English capital to the Welsh and can choose between English, French, Polish etc. etc….but not Welsh. I saw this sign at a wayside viewpoint in the hills that rise above the north east banks of Loch Nis (that’s Loch Ness for those of you slow to work things out). There’s a token Gaelic headline but everything else is in English. Even the Gaelic is treated to one of those jokey phonetic transcriptions. Walking round Inbhir Nis, I saw that many of the streets are signed bilingually and there were one or two Gaelic translations at tourist spots such as the way up to the castle). The Gaelic though is in a much smaller font and a “Celtic” script is used. Size matters and as for the script, to me this smacks of quaint folkification. Like in the shots above, to me it’s about making the language safe for the tourists. Looking out of the train window on the journey from London to and from Inbhir Nis offers exhilarating views of landscape. I’m fired up in a different way when it comes to what I see of language usage, though. The thing is, you have to look at bastardised forms of beautiful Gaelic place names. I can see the sense of this where the English and Gaelic names are completely different. It’s not too much in the twenty-first century, though, to expect everyone educated in Scotland to be able to read and pronounce Gaelic orthography, even if they don’t know the language, is it? It’s not actually that difficuult and don’t they have twelve years compulsory education up there? Time to ditch the silly Anglo spellings, you Scottish saddos! The Welsh have almost got rid of Caernarvon and Llanelly (for Caernarfon and Llanelli), though they still tolerate abominations like Llantwit for Llanilltyd…., the twits. The fight for public status for the language on official signage and forms in places like state post offices and the law courts was the first campaigns of the Welsh Language Society in the heady atmosphere of 1960s protest. It could, of course, be argued that fighting for token status and individual rights diverted attention from the more vital need to shift norms of actual usage as a work of language in economic and civic life. My answer: you need both. In the twenty-first century, you’d expect Scotland to be leading in the visibility of the language, even if less was being done about training staff to use it…. Now, credit where credit’s due. Here’s a Post Office at Port Rìgh (or, as they seem wont to prefer “Portree”, on Skye) that gets it more or less right (you just need to move the Gaelic to the top, boys). Back in Inbhir Nis, though, there’s not a word of Gaelic in sight at the Post Office. This is a post box at Caol Àcain (“Kyleakin” – actually originally a Norse name) just over the bridge on the An t-Eilean Sgitheanach (the Isle of Skye). No Gaelic in sight. This sort of things from the Post Office is, thankfully, more or less unthinkable in Wales now (at least as regards token displays of the language….If you want to work through Welsh, God help you!). Their message to us: “We’re keeping it Anglo-Saxon here, as in: ‘f*** off”, Gaels. Our message to them: “You need a new language usage law”. Moving a bit more up-beat, there are many official bi-lingual road signs, like the one pictured below. It’s a sign on an “A” road (major trunk road – in the UK they are always done on a green background with white script, as here). Gaelic has been added in the same orangey-yellow that is used throughout the UK for the road numbers. There are several aspects of this design that I like. First, the Gaelic is on top. In Wales, Welsh only goes on top in several of the western counties (and Powys, the large border county in the east) and “language order” prefers English in the populous counties of the South, fiefdoms of the traditionally British Labour party (and thanks to the intervention of the Labour Secretary of State John Morris to keep Welsh down in the 1970s). I like the use of a different but still just as vivid colour for Gaelic. In Wales, white is used for both languages. It’s also great, to my mind, that the standard road sign typeface is used. Other options would have been to Italicise (as is often the case in the Republic of Ireland) or to use a “Celtic”-style script (this used to be more common in the Republic of Ireland). In addition to the road signs, I saw other examples of a confident, normalised use of Gaelic. This bi-lingual police van in Port Rìgh is bold and confident (and a very recent development). Or, does it belong with the picture from Aviemore train station…(or should that be Avvy-more 😉 )? Do we need the English at all? In Ireland they seem to manage well enough just with “Garda” on their police cars. If you can’t work out what Poileas means on a white van with a dirty great flourescent yellow and blue stripe down the side flashing blue lights on the top, are you really bright enough be allowed out on the streets without adult supervision? 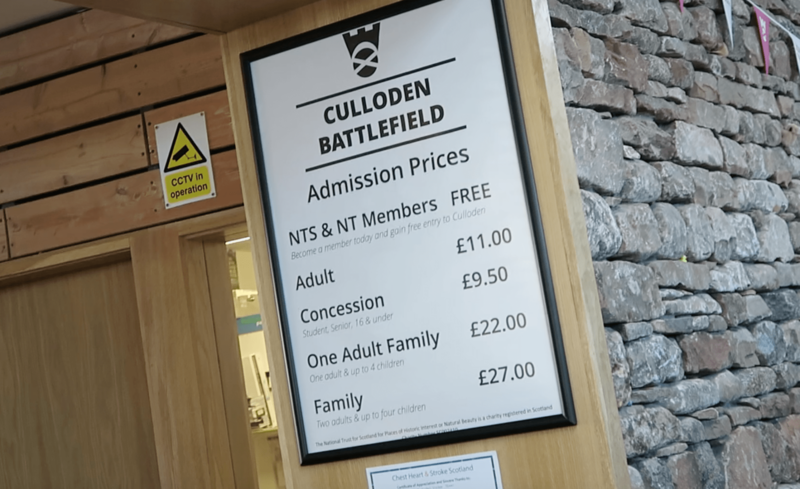 I liked these two signs at the visitor centre at Cùil Lodair (Culloden). So there we have it, our “safari” and my personal commentary draw to a close. Now, I know that there are differences between the situation of the two languages. But there many similarities, too….Not least in the tunes sung by the Brit-Nat anti-indigenous language bridgade in both countries (and pretty much everywhere else where this is an issue, I’d guess). What do you think? Are you Scottish? Do you see parallels with the way indigenous languages are treated where you are? Let me know in the comments below. I’m writing this from Dùn Èideann (Edinburgh) as I’m up in the Scottish capital for a few days, centred around a language lover’s meetup or “polyglot pub” event that took place at the weekend. I was one of the presenters and there were seven or eight short talks altogether, including two inspiring talks about Scottish Gaelic. Look out for vlogs from the trip soon on the YouTube channel and a summary blog here on the site.